A couple of weeks ago, on the mission trip to Virginia with the youth, the work boots I was wearing finally gave out. The sole of the left shoe became separated from the mid-foot all the way to the toe. The sole of the right shoe was still attached, but it looked like it was about to go too. Two rounds of tape allowed me to make it through the final 2 days of the week, but upon returning to Washington I retired them to ornamental status in my office. These boots tell a story. I first bought them in the spring of 2000 in preparation for a mission trip to Lithuania. I had just turned 17, and it was finally time for me to own work boots. On that trip to Lithuania, they were christened with orange and green paint from painting playground equipment in a high density neighborhood, and traces of concrete from a church courtyard we were repairing. The next year, the boots went to St. Lucia, where they acquired dirt and rocks and more concrete as I built a fence around a schoolyard. Seeing as were in the Caribbean, the boots also acquired their first sweat stains inside. The boots stuck with me through 4 spring break mission trips in college: three with Ohio Northern University Habitat for Humanity, and one to Monterrey, Mexico, where we helped build a parsonage for a church. During that time I also did 2 local mission trips in Western PA through Jumonville, and a Uth4Missions trip with a church I worked at in 2003. 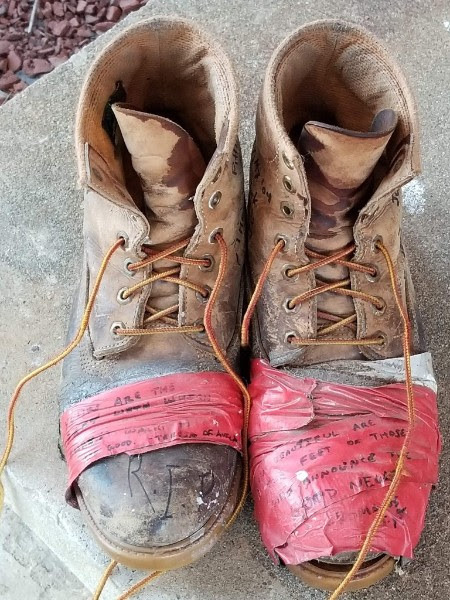 After that, the boots were primarily used around the house or as we began renovating my wife’s family cabin, but I took them on a couple more mission trips, including one to the North Side of Pittsburgh. I moved the boots into semi-retirement in 2016, when I bought new boots to replace them. But these are my mission trip boots, so I took them on the youth mission trip earlier this month with U.M. Army in Danville, VA. Though I didn’t know at the time that this would be their final trip, it was a fitting ending for boots that served me – and more importantly, served Christ – so faithfully for so many years. So, after 18 years, at least 10 mission trips in 4 countries, and countless people served in the name of Jesus, these boots have become a symbol to me of God’s call upon my life. Spreading the Good News of Jesus sometimes means being the hands and feet of Christ for those who need it. I am thankful for the places these boots have taken me, not only for the sights I’ve seen or the work I’ve done, but because of the people I’ve met along the way. That’s why these boots, old and worn as they are, no longer functional even with duct tape reinforcements, stained with sweat and paint and concrete, are so beautiful to me. They have been and will forever be a blessing. Where have your “boots” taken you in service of Christ and neighbor? What blessings have you received from doing the work of God’s kingdom?